With all of the talk floating around this year about "jobs" and how politicians aren't doing enough to preserve and promote jobs in this country and how they should punish those who send jobs elsewhere at the expense of our own friends, neighbors and local businesses, I'd like to take a more positive tack by encouraging others to support, and buy from, Midwestern businesses. So, I'll be posting a few short lists of suggestions for your holiday shopping consideration over the next couple of weeks. My most recent shopping expedition was to the Miners Den, a local jewelry store where I've shopped for years and that creates a lot of nice pieces in-house. For the record, I grabbed a great deal on a Fordite pendant for myself. Illness in the family forced me to do more of my shopping online in recent years, but I make it a habit to search out local and indie places throughout the Midwest when I'm shopping online as well. The most recent package that arrived here was from Gwen Frostic's paper goods place in Benzonia (Michigan), which I promptly wrapped and put under my tree! Tim and I both love shopping at Cherry Republic in Glen Arbor, Michigan and made sure we made an online stop at the store for a couple of gifts for his dad, a cousin and for ourselves. Our purchases this year included all sorts of cherry goodness that include dark chocolate covered cherries, milk chocolate covered cherries and sour patches (my favorite from their candy department). I've had good luck shopping their retail stores, ordering online and placing my orders by phone. I placed my most recent Cherry Republic order via phone to the Glen Arbor store, which is a 5-hour drive from here, and it arrived here in metro Detroit the next evening! We're also big fans of Skyline Chili, which is a Cincinnati favorite. It isn't readily available outside of Ohio, but you can easily grab some of the canned version online. They have 4-can and 8-can packs, and if you have an Amazon Prime account, you order them and have your own Skyline dinner in a couple of days. We had Skyline 3-Way meals, with the chili over spaghetti and smothered with grated cheese. Tim skipped the hot sauce, but I opted for some of that and a beer as well! I discovered Dot's Homestyle Pretzels earlier this year when I heard a couple of folks rave about them. Problem is, they're from North Dakota, and I've yet to find them here in Michigan. Again, you can managed readily find them on Amazon, and I've already ordered them a couple of different times. These are hearty pretzel twists with a unique mustard-style taste. Check back here soon for more Midwestern gourmet goodie suggestions and some other non-food gift suggestions! Remembering Red Wings Legend Gordie Howe-Detroit hockey fans mourned the death of Red Wing legend Gordie Howe in early June. Farlane shares an overview of Howe's career with the Wings (which dated back to the 1940s) from the Hockey Hall of Fame. Check it out at the Michigan in Pictures blog. Long-time Wings fans (Tim and I included) all seem to have some sort of personal memory of Howe and remember him for his love of the game, respect for the fans and, especially, the joy he showed interacting with his youngest fans. Truly a class act! An historical stay at the Old Mission Inn-We've visited the Old Mission Peninsula near Traverse City, Michigan many times, but we've never stayed at this inn. Even so, I especially enjoyed reading about Ted's visit here and about the inn's history. Check it out on the Traveling Ted blog. Sky-high Chicago-This is a nice photo essay about one of Glenn's favorite cities, which includes, as the title promises, some sky-high views of the city. We "met" early in my own blogging days when Glenn was sharing many of my stories about Ohio and we were both comparing notes about our favorite hockey teams! Check out the story at the Travels In Progress blog. Chicago's Advantages-Aaron lists some of Chicago's most distinguishing and positive features, which he says includes its beautiful lake front with an endless string of parks and (one of my favorites) the city's fantastic architecture. Check out Aaron's list at his eponymous blog, and let him know what you like most about the city. Midwest Travel Experts on 50 Best Coffee Roasters You Need to Know-It's obvious that Jessie loves coffee, and she shares this list of some of the best coffee roasters in the Midwest that she put together with the help of other coffee lovers in the region. Stay awake on the road! Check out this list at the Wandering Educators blog. Little Indiana: Jasper County Torchbearer for Indiana Bicentennial Torch Relay-I wrote about Indiana's Bicentennial Torch Relay earlier this year as planning for the state's 200th started switching into high gear. Jessica offers readers an inside track on the relay as she recently learned she is one of the torch bearers for Jasper County! Check out her at the little Indiana blog. (Also be sure to check out Jessica's newly published guide book to small-town Indiana). Tour a Lustron Home in Columbus-I love vintage architecture and home furnishings. Tonya takes readers on a trip through time to tour a vintage Lustron home on display at the Ohio History Center in Columbus, Ohio. The Lustron company produced these pre-fabricated homes of porcelain enamel and steel just after World War II to house veterans returning home at the end of their military service. The house reminds me a bit of the then-futuristic Dymaxion House, built of stainless steel during the late 1940s, on permanent display at The Henry Ford Museum here in metro Detroit. Check out the Lustron display at the Traveling Praters blog. 7 Amazing Experiences you wouldn't Expect to have in Ann Arbor, Michigan-but totally can!-The home to University of Michigan has the sort of vibrant foodie scene and great museums that you expect to see a college town, and we're lucky to live within an hour drive from this southeastern Michigan town. We love this list that includes some Ann Arbor favorites like Zingerman's family of foodie businesses, the cool and retro Fleetwood Diner and Kelsey Museum of Archaeology. Check out Mary's post at the Traveling Mom blog. On Top of the World at Wind Point Lighthouse in Racine, Wisconsin-We've visited many lighthouses along Lake Michigan, although we've yet to really explore the light stations on the lake's western shore in Wisconsin. We hope to rectify that one of these days, but meanwhile, I'll enjoy this story about the Wind Point light at Racine with its expansive Lake Michigan views from Mel at A Little Time and a Keyboard blog. Fargo-Moorhead Visitors Center: An Attraction in Itself-A visit to the Fargo-Moorhead Visitors Center offers the chance to pick up travel information about North Dakota, but Connie found that it also offers the opportunity to get a photo taken with the wood chipper made famous in the movie "Fargo". Check it out at the Midwest Wanderer blog. Valley City Historic Bridges Tour: Exploring Bridges over the Sheyenne River-Here's a second story from Connie this month as I don't see many posts about North Dakota cross my desk and I'm a big bridge fan. Find out about several different spans in Valley City (about 60 miles west of Fargo in eastern North Dakota). Check it out at the Midwest Wanderer blog. Oz Trivia in the Great Lakes State-Did you know that author L. Frank Baum lived in Chicago and summered with his wife and family at Lake Macatawa near Holland in western Michigan? Kath looks at Baum's "Wizard of Oz" book series, the classic movie and possible connections to people and places at his summer home in Michigan. Check it out at the Great Lakes Gazette blog. One Tank Trip: Wooster, Ohio-Wooster is a cool college town in northeast Ohio. We've driven through the area more than once and most recently visited Lehman's in Kidron (I agree with Charity that this retro department/hardware store is pretty incredible!). Hoping to head back to the area soon and check out some of the sites mentioned in this story. Check it out at the I heart ( ♥ ) Cleveland blog. The Dayton Arcade-We're familiar with Nickels Arcade in Ann Arbor and I only recall seeing a similar architectural arcade in Cleveland, so I enjoyed Ronny's story about this arcade, now sadly abandoned, in Dayton, Ohio. Check it out at the Queen City Discovery blog (and a bit of an update about a possible new life for the arcade). The area around the small towns of Glen Arbor and Empire in northern Michigan is among some of the most scenic in the state and the closest to the Sleeping Bear Dunes National Lakeshore, which earned the title of "Most Beautiful Place in America" among 100,000 viewers of ABC Television's "Good Morning America" program a couple of years ago. Make sure you leave plenty of time to stop and enjoy the spectacular views and savor the small town charm that we've always found so appealing as you travel along M-22. The 3,400-acre site contains over 120 buildings in various states of repair, restoration and disrepair that date back to the mid-1800s when the town was a thriving lumbering, and later a farming community, before becoming largely abandoned by the 1930s and 1940s. This ghost town is definitely worth a stop if you love capturing images of weathered wooden buildings. 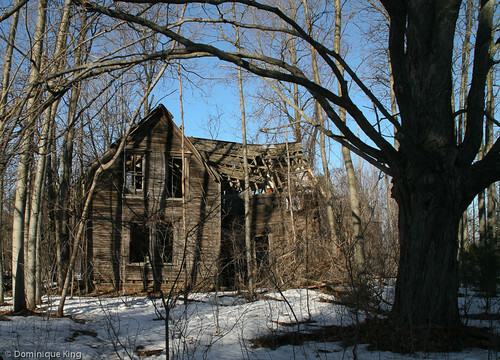 One of our favorite photo subjects here is a crumbling old farmhouse we affectionately call "the Spooky House". We've captured a number of images of the house, documenting its continuing demise over the past half-dozen years, so it's always a must-see when we visit the area. One of the best, and most accessible, ways view the dunes is to turn off onto the Pierce Stocking Scenic Drive. The drive is a 7.5-mile loop through the Sleeping Bear National Lakeshore Dunes area and includes several stops along the way where you can get out of your vehicle to enjoy breath-taking scenic overlooks as you capture the bluff-side views with your camera. Want something a little more challenging? Check out the Sleeping Bear Dune Climb. The Dune Climb is a must-do test of stamina for many Michiganders, and many folks I know have memories of making this climb as teenagers, so I was pretty happy when I finally crossed it off of my bucket list about a decade ago! Erosion is always a concern in dune country, so it's best to make the climb at this NPS-maintained site, rather than at one of the more ecologically vulnerable or unstable dunes in the park. Head on into Glen Arbor for a bite to eat or a little shopping. We particularly enjoy stopping at Cherry Republic, a store that stocks all things cherry. Cherry jam, jelly, sundae sauce, dried nut and fruit mixes, salsa, mustard, soft drinks, salad dressings, candies, chocolate-covered cherries and wine are just a few of the items you'll find in the store. Can't decide what sounds good? There are always lots of product samples placed around the store to enjoy as you browse! The store also has a small cafe where you can stop for a quick meal that is open year round, and it's one of my favorite ice tea stops (love their cherry ice tea!). It's also worth the time to loop back around on Route M-109 to check out Glen Haven, a restored mid-1800s community that started as Michigan's logging industry flourished here. The village's protected harbor and convenient port location helped spur Glen Haven's growth as Civil War veterans returned home from the war and D.H. Day, an agent for a local transit company with two dozen maritime vessels operating from the port, worked to diversify the village's economy by establishing businesses like a cannery to process and ship cherries and other fruit grown in the area as the heyday of lumbering in northern Michigan faded. Summer is an especially nice time to visit the village, now maintained by the National Park Service. 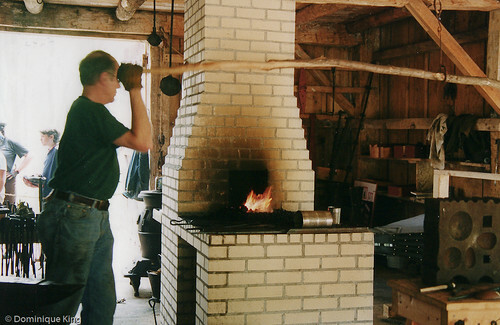 Places like the restored General Store, Blacksmith Shop and the cannery, now a museum housing the largest public exhibit of Great Lakes small craft and equipment, often open during the summer months. Want to learn more about some of the places mentioned on this leg of the trip? Check out these books for young readers, The Legend of Sleeping Bear and S is for Sleeping Bear Dunes by Kathy-Jo Wargin, author and Gijsbert Van Frankenhuzyen. See Sleeping Bear: Yesterday and Today by George Weeks for an overview of the history, pre-history and folklore of the dunes area. Author Tom Van Zoeren worked as a Park Ranger at Sleeping Bear Dunes National Lakeshore for twenty years as he collected and taped oral histories from Port Oneida residents. Check out his Images & Recollections from Port Oneida series of books and historic images: The Burfiend and Baker Farms, The Thoreson Farm and Its Neighbors and The Werner Farm and Its Neighbors. Be sure to check out Part 1 and Part 2 of this road trip series about Michigan's Highway M-22. We've visited northwestern Michigan many times over the years, and for those of us who live in Michigan, it was our little secret for many years. It's not a secret any more since more than 100,000 folks voted to name it as the "Most Beautiful Place in America" in a competition for that titles among views of ABC Television's "Good Morning America" program a couple of years ago. I still sort of wish it was still our own secret, but I guess it's time now to share some of the fun! I've written many stories over the years about this region, and I'm finally gathering the stories together for a multi-part series of suggested stops along Michigan's M-22 highway. Part 1 of this series covered highlights of the route from Traverse City to Suttons Bay. You're truly getting away from the busy area surrounding Traverse City and enjoying a beautiful coastline drive along Grand Traverse Bay on this leg of the trip. 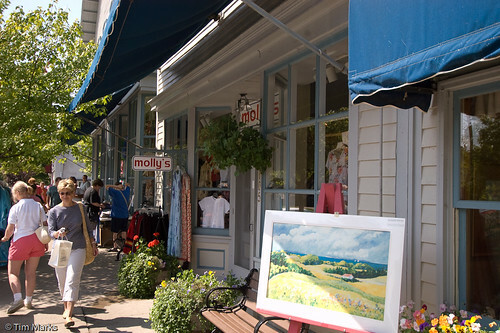 Northport has a nice little downtown with a few eateries and stores, and the area is a favorite place for celebrity chef Mario Batali to spend his summers. You don't want to miss heading north of town for a detour on Michigan State Route 201 to see Peterson Park, the rustic 1930s-era Woolsey Lake Memorial Airport, and the Grand Traverse Lighthouse. 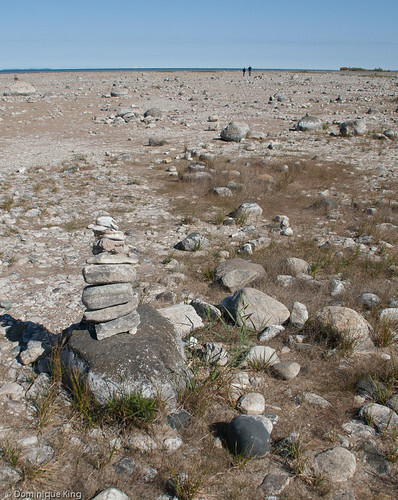 Continue north to find Peterson Park and stop to find a remote rocky beach along the Lake Michigan shoreline. There is a small picnic area and viewing platform near the parking lot that offers a bluff-top view of Lake Michigan. Getting to the beach requires a trek down 114 stairs, but it's a must for rock hounds and folks looking to walk along a beach bereft of the summer crowds of sunbathers and beach volleyball players. We always wondered about the story behind the Woolsey Memorial Airport and its resemblance to other Works Progress Administration structures we'd seen in Michigan. We finally stopped there for a closer look at the vintage airport late last year and learned of the story behind the pioneering aviator the airport honors. Woolsey wanted to make the first solo trans-Atlantic flight, but tragically lost his life in early 1927 before doing so. Another young aviator (Charles Lindbergh. Ever hear of him? ), who reportedly took flying lessons with Woolsey, achieved the goal later that same year. This little airport, a WPA building finished in 1935, serves as a nice memorial to Woolsey. The Grand Traverse Lighthouse sits at the very tip of the Leelanau Peninsula in Leelanau State Park. 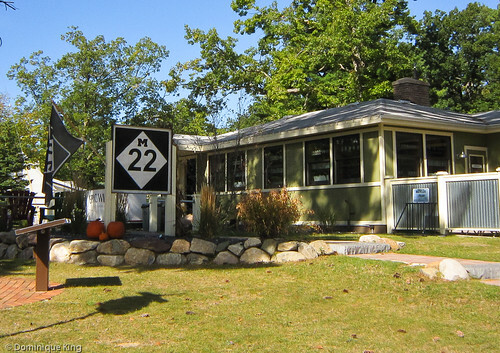 Drive back to Northport and catch M-22 again, going south along the western shore of the Leelanau Peninsula to Leland. By now, you might be ready for lunch, and depending on the season, our favorite places for lunch along this stretch of the highway include Fischer's Happy Hour Tavern just a few miles south of Northport or the Cove at Leland's historic Fishtown. We particularly like cozy Fischer's for its soup and pub fare during the winter. The Cove, which closes for several months during the winter, is a nice place to eat outside on the patio overlooking the lovingly preserved commercial fishing shacks and docks and watch salmon heading upstream over a dam to spawn. Don't miss the Cove's famous clam chowder! Leland has a compact and walkable downtown small-town shopping area (make sure you stop at Leelanau Books while you're in town, where you can use the WiFi or grab a cup of coffee as you browse it's a great selection of regional books). 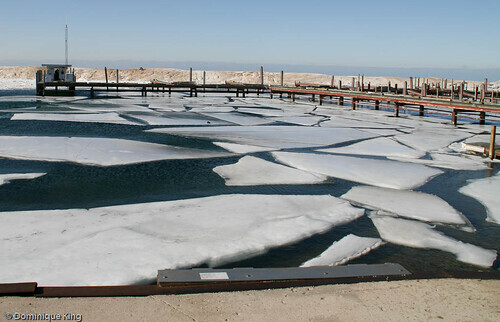 Winter in Leland offers a much quieter scene as large slabs of ice can create abstract patterns in the bay as visitors dream of the hustle and bustle of summer in the popular tourist destination. Come on back here next week as we head south further south on M-22 to Glen Arbor and Empire, home to the headquarters of the Sleeping Bear National Lakeshore. Want to learn more about some of the places mentioned here? Try checking out Fishtown (A Short Story Collection from Leland, Michigan) by Bill Crandell , Fishtown by Laurie Kay Sommers or Grand Traverse Lighthouse (Images of America) by Grand Traverse Lighthouse Museum. People sometimes ask me about the small M-22 charm I wear on a chain around my neck. It is a very special present Tim got me last Christmas as a souvenir of one of our favorite places on earth! It was no surprise to us when more than 100,000 viewers of ABC's "Good Morning America" television show named the Sleeping Bear Dunes National Lakeshore as the "Most Beautiful Place in America" because we've traveled many times over the years in this area. It's beautiful no matter how you get here, or what time of year you visit, but our favorite way to see the area is by taking a road trip along Michigan's highway 22! Traverse is the largest city along this route, and it's possible to spend an entire week or so in town without seeing or doing the same thing twice, but we actually tend to spend very little time in Traverse City itself as we're anxious to get on the road and explore M-22! Shoppers love downtown Traverse City with its huge selection of trendy gift, home decor, clothing and other stores. We always make sure we stop at Horizon Books, a great indie book store in downtown Traverse City, and I've got a soft spot for the city's vintage Ben Franklin store a bit out of downtown. The city also has a great foodie scene, with interesting choices like Red Ginger with its elegant pan-Asian menu and a place called Georgina's, which we first tried late last year because we couldn't resist the idea of a place that describes itself as an "Authentic Asian and Latin Taqueria"! We find it best to check out the restaurants during the off-season as the city is busy with hordes of tourists during the summer months. We watched over the past decade or so, fascinated, as the city tackled the historic preservation and development of the old Traverse City State Hospital (a.k.a the Northern Michigan Asylum) into a stunning mixed use campus featuring homes, restaurants, stores, recreational facilities and a favorite coffee shop, Higher Grounds. Work on the development, by the way, still continues today. Seek out a little of the hospital's old history tucked away in a corner of the campus by Honoring Traverse Colantha Walker at the gravesite of the institution's champion milk cow! Slip back in time at Sleder's on the outskirts of downtown TC, Kiss Randolph the Moose, eat some fried pickles and enjoy a burger and beer as you learn a bit about the town's history, its nineteenth-century immigrants and the skilled woodworkers and other craftspeople who built Traverse City. We also love the Dennos Museum Center on the campus of Northwestern Michigan College. Be sure to check out the museum's Inuit Art Gallery, where I scored a small print of an Inuit hockey player celebrating a goal during a game of pond hockey. If Traverse City has too much summertime drama for you, you might want to visit Suttons Bay as a little less hectic option. Small-town Suttons Bay is just 15 miles north of downtown Traverse City along the eastern side of the Leelanau Peninsula, so it's a fairly quick ride into Traverse City for a special event, or to check out TC's foodie scene. But Suttons Bay has its own shopping and dining scene (try Boone's Prime Time for pub fare or Martha's Leelanau Table for a more gourmet take on home-cooked regional specialties in a homey atmosphere), as well as a nice four-season bed and breakfast inn called the Korner Kottage where we enjoyed a stay a couple of years ago. Want to learn more about some of the places mentioned here? Try checking out Beauty is Therapy: Memories of the Traverse City State Hospital by Kristen M. Hains and Earle E. Steele, Traverse City State Hospital (Images of America) by Chris Miller, Northern Michigan Asylum: A History of the Traverse City State Hospital by William A. Decker or Traverse City in Vintage Postcards by C.S. Wright. And, as always, as much as I appreciate my in-car GPS, I feel nothing really beats taking along a good hard-copy map like the Michigan Atlas and Gazetteer by Delorme. Come on back later this week as we head further north to the remote tip of the Leelanau Peninsula and begin traveling back down M-22 on the western side of the peninsula towards the Sleeping Bear Dunes and National Lakeshore! Winter Magic: Our First-Time Family Excursion to Grand Rapids!-We frequently visit Grand Rapids on the western side of Michigan, but it was fun to see the city and it's attractions from the point of view of a parent with young children. Amy's post about her family's visit to the city at the My Experience Grand Rapids blog included one of my favorites-riding the carousel inside of the Grand Rapids Public Museum-and a couple of other things I thought would be fun for "big kids" like Tim and me-root beer tasting at The Electric Cheetah (which is already on our GRap bucket list) anyone? Traverse City: A Beloved Getaway for Michiganders-Traverse City Michigan's northwestern Lower Peninsula is another favorite destination for us. We're planning to head up that way later this winter. 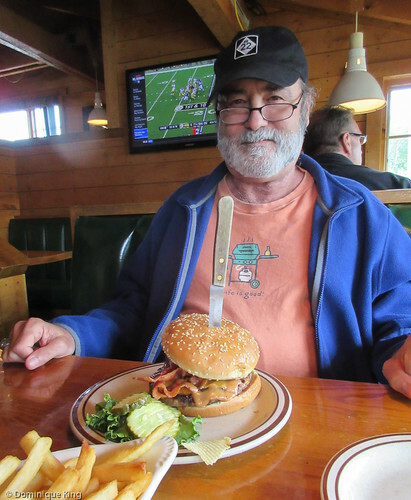 Meanwhile, Max takes readers of the Go Nomad blog to some of our favorite TC destinations like Horizon Books and Cafe, Cherry Republic, Leland's Fishtown and the Sleeping Bear Dunes National Lakeshore. 28 Fun Things to do in Indianapolis-Natalie shares this great list of Indianapolis area attractions at the Doing Indy blog. We've visited places around the city in recent years, but it's been years since we've visited the city itself. Spending a little more time in Indianapolis is another item on our Midwest bucket list, and this list looks like a great place to start planning future visits there! Cheap Winter Getaways-Check out this great list of winter travel suggestions from the crew at the Midwest Weekends blog. I'm a big winter fan, and although I've visited places like the Apostle Islands National Lakeshore in northern Wisconsin, Copper Harbor in Michigan's Upper Peninsula, some of Chicago's museums and places like Ely and Duluth in northern Minnesota during the summer, several of the things on this list have long been on my personal Midwest travel bucket list. Grand Forks' Ralph Engelstad Arena offers hockey fans great facilities, play-Hockey in North Dakota? I'd be all about that. We've seen the University of North Dakota play at college tournaments in Detroit in the past (including one memorable time when we sat through two overtimes to see UND win a Great Lakes Invitational tourney). I really loved getting this glimpse of the team at their home arena from Tim at The Walking Tourists' blog. Thirty-One Thresholds: Discoveries at the National Mustard Museum? Indeed!-I love this idea from Wisconsin photographer an blogger Bo Mackison that requires her to head out of her home and visit some Madison-area attractions with her camera and write about those experiences on her personal blog. The National Mustard Museum has long been on my Midwest travel bucket list, so I loved getting a glimpse of the museum and its history here. 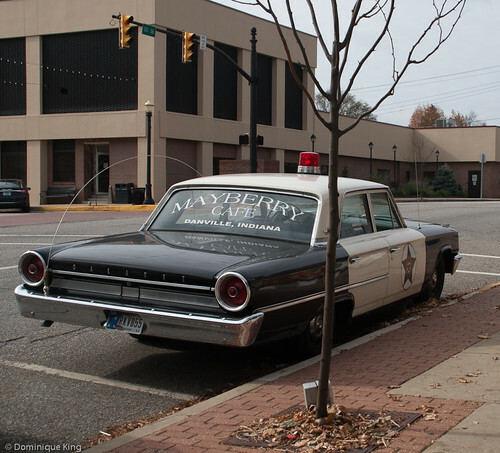 Mayberry Cafe: Blast from the past-Visiting this quirky eatery in Danville, Indiana is a special treat, especially for fans of the old Andy Griffith television show from the 1960s. 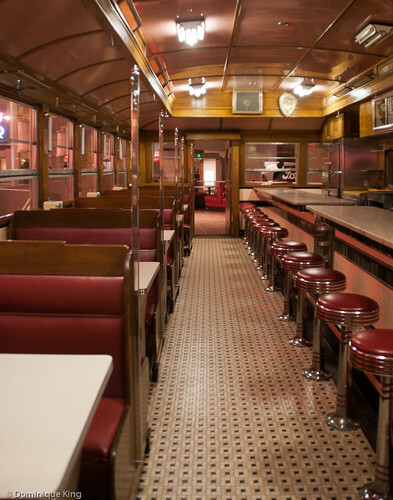 Tim and I ate here a couple of years ago, so I especially enjoyed revisiting it virtually via this post from Kayleen on the Indiana Insider blog. Wordless Wednesday: Randolph County Courthouse in Winchester-I'm a big fan of old county courthouses, and Indiana seems to have a number of great ones worth visiting. Check out one of Jessica's favorite Indiana courthouses with this story at her little Indiana blog. Indiana Bridges: Ferris Wheel Turned Dunns Bridge-I'm also a big bridge fan, so I loved learning a little about the creation of the Ferris wheel and this unique bridge in northern Indiana that may, or may not, be able to trace its origins to an attraction at the 1893 Chicago's World's Fair. This story is also at Jessica's Little Indiana blog. (For what it's worth, I also love true crime books. Want to learn more about Chicago's historic World's Fair? Check out The Devil in the White City: Murder, Magic and Madness at the Fair that Changed America by Erik Larson). The City That's Using a Trail to Unite Its Citizens-Check Max's story at the National Swell blog about the Indianapolis Cultural Trail. The pedestrian and bike path official opened in May of 2013, and this story cites its positive effect on the city's cultural life, economic health, community life and the health of residents and visitors to Indianapolis. 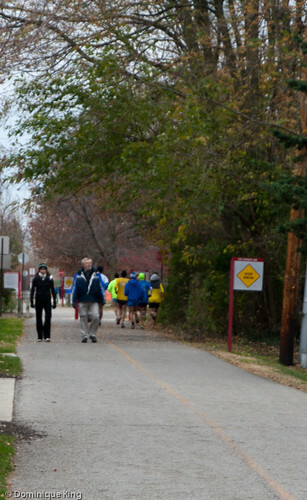 The Indianapolis area has several other nice pedestrian and bike trails, including the Monon Greenway, which we spotlighted in a story here after our visit to Carmel a couple of years ago. History through headstones-We often visit old cemeteries when we travel, and we don't see that as creepy at all. 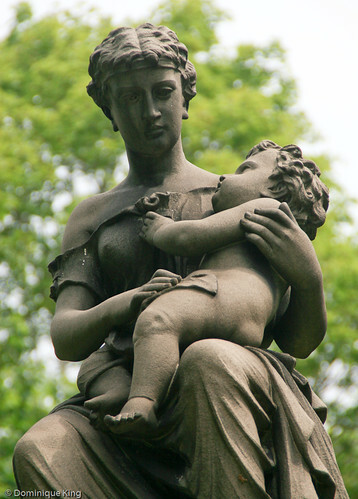 Cemeteries can be interesting places to learn about an area's history, take photographs of beautiful statuary or architecture and opportunities to geocache. This story from The History Center of Allen County and Fort Wayne spotlights historic cemeteries and the Little Turtle Memorial in downtown Fort Wayne, which we discovered ourselves a couple of years ago. Check out the story at the Visit Fort Wayne Insider blog. Wisconsin Cranberry Harvest-Cranberry sauce is one of my favorite parts of the Thanksgiving holiday, so I loved Julie's first-person account of harvesting these tasty little gems in Wisconsin's Cranberry County. Call me weird, but I'm definitely jealous of seeing Julie wearing waders and standing hip-deep in a cranberry bed! Check it out at the Wisconsin Parent blog. 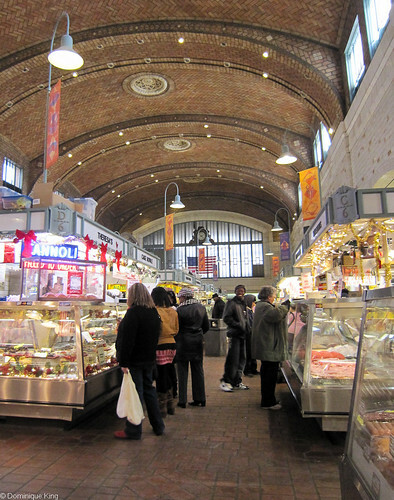 West Side Market-This is one of my favorite year-round farmers markets, and we've wanted to get back to Cleveland to visit this market again, Seeing Mike's post about the market really got me in the mood for some holiday shopping, although I'm with him on knowing that if I spent too much time there, I'd spend a TON of money on some really great local food! Check out his story on the OHventures blog. Uncovering Secrets at the Clinton County Courthouse-I am definitely a sucker for late-nineteenth-century county courthouses. The architecture and decorative details in Ohio's Clinton County Courthouse are stunning, and like many courthouses of this vintage, there is plenty of great history to go with the building. Read Tonya's story about it at The Traveling Praters blog. Visiting Marblehead Lighthouse State Park-As much as I love great courthouse buildings, I'm probably even more fascinated with lighthouses. 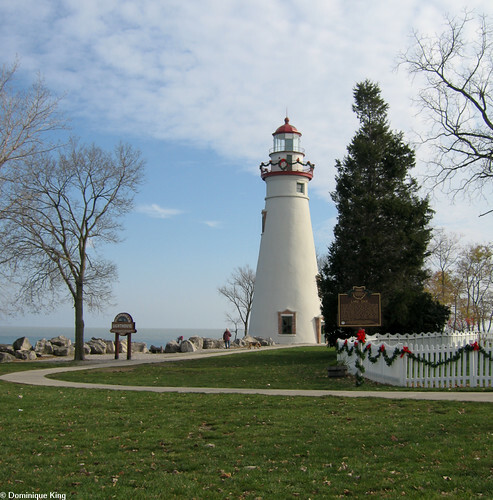 I've written about plenty of Great Lakes lighthouses here at Midwest Guest, and Ohio's Marblehead lighthouse has to be among my favorites. We've been out to Marblehead to take photos in the summer and winter, but we've yet to make it at the height of the autumn color season. Check out Tonya's story about the lighthouse and nearby the keepers house (which is also on my bucket list of places to go), also on the Traveling Praters blog. A Yen for Yurts-I've never been much of a camper, but I could totally get behind the idea of staying in a yurt. This has long been on my bucket list since seeing one in northern Minnesota a number of years ago. This article at the Midwest Weekends blog reminded me of why the idea of a yurt stay originally fascinated me, and it includes a list of places to find yurts in places like Minnesota, Iowa, Wisconsin and (be still my beating heart!) Michigan. Can the Hotel Itself Be the Destination?-I'm always on the lookout for unusual and unique places to stay, and I remember hearing about the Hotel Pattee in Perry, Iowa a couple of years ago when several blogging friends stayed there during a conference. Sheila apparently saw the same messages about this hotel during the conference and recently found an opportunity to stay there herself. Check out her story at the Perceptive Travel blog. Michigan-Henry Ford Museum-We love close enough to this museum and have memberships to The Henry Ford, so we visit fairly frequently throughout the year and sometimes just sneak over for an hour or so for a walk or to take some photos. Terri and her family sagely stuck with just doing the museum during their one-day visit, but hopefully they'll be able to return and spend the day at the Greenfield Village as well. Check out the story of her visit to the museum at the Travel 50 State with Kids blog. Northern Indiana's Tombstone Trail tells tales of the departed-We've long included cemeteries in our travel plans because we like the historic tales we can often learn about a location by visiting the local graveyard. Additionally, these locations are among the best geocaching locations and provide some of the best opportunities for taking great photos we've found in our travels as well. Check out Maggie's story about a self-guided "Tombstone Trail" in northern Indiana's DeKalb and Noble counties at Indiana Landmark's Hidden Gems blog. Tour a Former Asylum at the Village at Grand Traverse Commons, Traverse City-I remember seeing this complex back in its deserted and derelict days and the excitement I felt when hearing about its proposed transformation into a mixed use development of residential, commercial and recreational spaces. I really wanted to take this tour when we last visited Traverse in northwestern Michigan earlier this fall, but the tour didn't run the days we were there. The place has an interesting history as an asylum, but I love seeing various parts of the complex reborn into more cheerful uses. Read about Connie's tour of some of the buildings still awaiting redevelopment at her Midwest Wanderer blog. 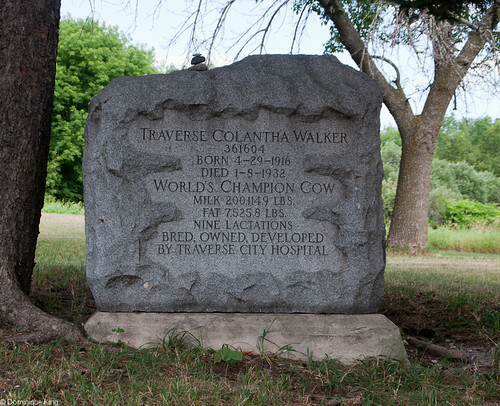 Meanwhile, if you do get up to the Village at Grand Traverse Commons, be sure to check out the gravesite of a champion milk cow on the grounds that I wrote about here-Honoring Traverse Colantha Walker. Les Cheneaux Islands: Dancing Waters B&B-I've followed Loreen's tales of her trek around the Great Lakes on her 1000-Mile Great Lakes Adventures blog for quite some time. It was a lot of fun to discover that she "followed" us to the Dancing Waters B&B in Cedarville, Michigan. I loved seeing photos of owners Jim and Betty and the progress Jim's made in the past year on the B&B addition. Oddball Michigan: A Guide to 450 Really Strange Places-Jessie reviews this book, which is definitely screaming my name, on the Wandering Educators blog. We love strange stops, like the Teenie Weenie Pickle Barrel Cottage featured in this review, and the quirkier, the better. Grand Traverse Commons Tour: A Popular Tourist Attraction-Touring the former mental hospital buildings at Traverse City, Michigan has long been on my bucket list, although we did manage to visit the grave of the famed Traverse Colantha Walker (a champion milk cow) on the grounds of this mixed-use development. Mike has tour info at the Traverse City True North blog. The Last Covered Bridge in Wisconsin: Cedarburg-I love covered bridges and cringe when one falls victim to vandals, a hit-and-run or simply crumbles because of the ravages of time. We have so few of these covered spans in Michigan (arsonists recently destroyed one, and another suffered damage when an over-sized construction vehicle hit it), so I was particularly interested in Kenneth's story about the Cedarburg Bridge on the Wisconsin Explorer blog. 14 Things to do in South Dakota-We found plenty to do when we traveled through South Dakota, and I see that Deb and her family also enjoyed places like Wall Drug, Custer State Park, Mount Rushmore, and Corn Palace that Tim and I enjoyed on our travels. Check out her story at Just Short of Crazy. 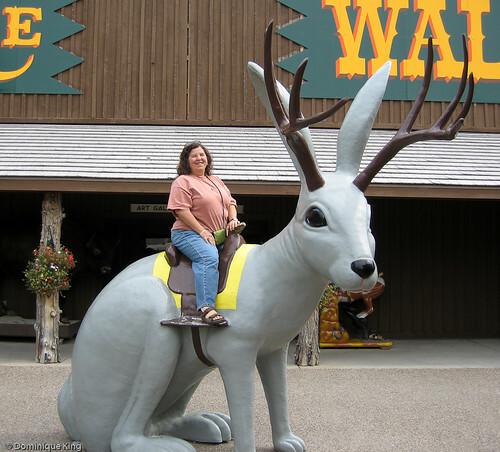 The famed Wall Drug "jack-a-lope"
Historic Park Inn: Last Remaining Frank Lloyd Wright Hotel-Connie takes readers on a tour of a Frank Lloyd Wright-designed hotel in Mason City, Iowa. The structure, built as a bank in the early 1900s, went through decades of neglect after the bank failed and the building remained mostly empty. A dedicated group of locals raised enough money to restore the building for use as a hotel and, in 2011, the historic hotel reopened to the public. Check out the story (and lots of photos!) at the Midwest Wanderer blog. Rockford Offers Collection of Unique Architecture-Chere ventured north from her home in Louisiana to check out some cool Frank Lloyd Wright homes and buildings in Rockford, Illinois. Check out her story about Rockford and its many attractions (gotta love a place that claims to be home to the Sock Monkey!) at the Louisiana Road Trips blog. Dubuque Incline is a Historical Ride-I loved the views we had of downtown Pittsburgh while riding the Duquesne Incline, and I loved reading about Tim and Lisa's ride on a similar incline in Dubuque, Iowa. Like the inclines in Pittsburgh, the Dubuque Incline opened during the late 1800s as a way to ease the trek between places in a hilly town. Check out their story at The Walking Tourists blog. My Midwest: Summertime in Indy-Lisa found some great things to see and do in Indianapolis, a town that seems to be experiencing a rejuvenation in attitude and revitalized, or new, attractions. The new eight-mile Cultural Trail through town and a chance to ride a gondola with singing gondoliers especially sounds like fun to me! Check it out at the LL World Tour blog. Edith Head's Hollywood Costumes Will Show You How to Dress for Success-I'm a fan of classic movies and costumes (check out my Vintage Fun board on Pinterest if you doubt me! ), so I loved Bee's story about an exhibit featuring the work of the famed Hollywood costume designer at the Decorative Arts Center of Ohio in Lancaster. I may not be able to get down to this exhibit before it closes in mid-August, but I'm enjoying the photos and story at beesfirstappearance blog. 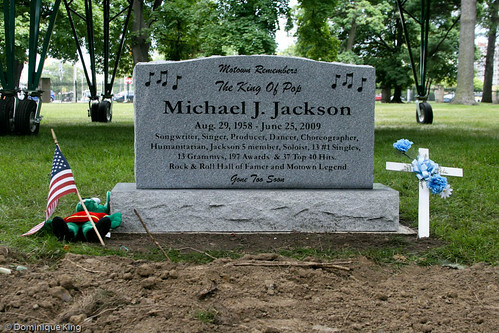 Quirky Attraction: Michael Jackson's Birth Home-Scott shares the story of visiting the gloved one's birthplace in Gary, Indiana on his Quirky Travel Guy blog. Jackson's story still fascinates fans and others five years after his untimely death in June, 2009, and Scott tells his readers that fans still stop by to see the site. I know that the story I wrote about a tribute headstone in a Detroit cemetery (which is not Jackson's actual burial place) still draws interested readers today. 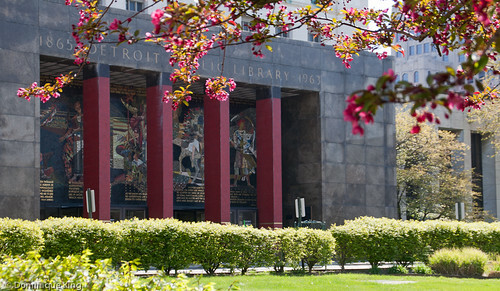 30 Famous Architects with Designs in Detroit-Check out Dale's article at the I Love Detroit Michigan blog for a great guide to some of the city's best architectural gems. I've visited, written about and taken photos of many of the sites mentioned here, but there are plenty of other gems I need to check out myself! Michigan Architect Minouru Yamasaki-I heard many lectures at DeRoy Auditorium, just one of many architectural gems on the Wayne State campus, early in my college career. I enjoyed farlane's post about this building and Yamasaki, who also designed the Twin Towers of the World Trade Center in New York. On This Day in Michigan: Traverse City State Hospital Grand Opening-Jennifer shares the story of a great Traverse City landmark at The Awesome Mitten blog. Designed by James Kirkbride, the hospital opened November 30, 1885 as a new model for treating the mentally ill. Today, the former hospital campus continues its innovative development as a multi-use community. Be sure to check out the gravesite of one of the hospital's most famous residents if you visit! Hockey Night in Hamilton-The Cincinnati area has a proud hockey history and "Gordon" shares one of the more interesting chapters of the area's hockey history with the story of a unique open-air ice rink at the Queen City Discovery blog. The place is unfortunately gone, but you can still see a few ghosts of the Hamilton Sports Complex rink and its proud past with this story. Crafting a Penrose Tiling-Ivan shares this story at The Mathematical Tourist blog about an intricate Penrose Tiling in the mathematics department at the University of Nebraska-Lincoln. Such mosaic-like arrangements take their name from the mathematician and physicist who began creating such works in the 1970s. In 1977, I Sat for Gary Ross; Now, Let's Go on a Scavenger Hunt and Find His Sculptures!-Betsy tells the story of a very special gift. Her father commissioned Columbus, Ohio sculptor Gary Ross to create a clay bust of a then-seven-year-old Betsy. Then, follow her around Columbus to find other works by Ross. On The Road With Bob Seger: 1969-1974-Great interview at the Found Michigan blog with photographer Tom Weschler, who was also Bob Seger's road manager during some of the earliest years of Seger's career. Includes some great photos and stories from Wayne State University Press book Weschler did with writer Gary Graff a few years ago-Travelin' Man: On the Road and Behind the Scenes with Bob Seger. What the Heck is a Yurt?-OK, so I know the answer to this one, and now, thanks to Jesse, readers of the Things to do in the U.P. also know that it's a sort of fancy tent on top of a wooden platform. I'm not much for rustic camping, but I think I could enjoy a stay in a yurt! Walking in a Winter Wonderland: 5 Winter Strolls in Traverse City-Mike takes readers on some of his favorite wintertime hikes at the Traverse City True North blog. We've visited Old Mission Point to walk out on the beach and geocache on some of the short trails nearby, and we've been looking at going back up to the Grand Traverse Commons to try the trail system there. Geocaching Through Fort Wayne: What is it?-Heather offers a quick primer on geocaching and creating your own urban adventure or a quick way to get outside on your lunch hour at the Fort Wayne Insider blog. Zaharakos for the Holidays-Nicole takes readers of her Arrows Sent Forth blog to Zaharakos for a special holiday treat. Zaharakos is an institution in the city of Columbus, Indiana, where generations of families have always gone to enjoy one of Nicole's favorite food groups--Ice Cream! Soaring through Nebraska Aviation History-We all know that the Midwest is more than "flyover country", and LuAnn shares some milestones from Nebraska aviation history at her self-named blog. Charles Lindbergh learned how to fly in the state in the early 1920s, and the first night airmail service departed from North Platte (in a snowstorm!) in 1921. Traverse City's Abandoned Asylum-I love wandering around the Grand Traverse Commons in Traverse City (Michigan), and I especially enjoyed Heather's photo essay from the grounds of the former northern Michigan Asylum at the Our Adventures Up North blog. I've heard that there are plans afoot to offer tours of the network of tunnels built to connect some of the campuses buildings, but they didn't seem to be offering them when we were last up there in September. During an earlier trip we did, however, find the grave of Traverse Colantha Walker, a particularly prolific milk cow that provided many, many buckets of milk for the institution's residents in the early part of the 1900s. Top 5 Ohio Graveyards-Visiting cemeteries is one of my favorite things to do when I travel. Check out the Discovering Ohio blog where Anietra shares some of her favorite Buckeye State graveyards, including some of my own favorites like Cleveland's Lake View Cemetery and the Brock Cemetery near Greenville, Ohio. 6 Indiana Town Cemeteries Where Things (Could) Go Bump in the Night-Jessica shares her list of a half-dozen great small-town cemeteries at here little indiana blog that look like great places to go for photo walks or to learn a little about Indiana history. Hemingway's Michigan-Erin checks out the ghosts of writer Ernest Hemmingway's northern Michigan past at her A Beautiful Fiction blog. I especially enjoyed reading this post as I recently finished reading The Paris Wife, writer Paula McLain's novel based on the life of Hemmingway's first wife Hadley that includes the story of the couple's wedding in northern Michigan. A Gem of an Island in Michigan-Check out one of Michigan's northernmost destinations with a post by Ross about Drummond Island at the Travel for Boomers blog. I've always heard great things about the resort on this island, but I wasn't aware of the island's great nineteenth-century courthouse! The Motor City's Fresh Take on the Urban Bikeway-There are an increasing number of opportunities to get around the "Motor City" that do not involve automobiles. Check out this story from Angie on the DC.Streets Blog about the Dequindre Cut bike path through the heart of Detroit, Michigan. Ludwig Mies van der Rohe - His Detroit Development-I love reading about Charlie's two-wheel adventures around Detroit at his Bikes, Books & A Little Music blog, and I especially appreciate his eye for some of the city's great architectural gems. Check out his story about famed German-American architect Ludwig Mies van der Rohe and his late 1950s Lafayette Park development that earned a spot on the National Register of Historic Places. City Guide: Minneapolis, Minnesota-Pola takes us on a tour of Minneapolis at her Jetting Around blog that includes a listing of some of the city's best attractions, foodie finds and tips about places that are a little off of the beaten path. 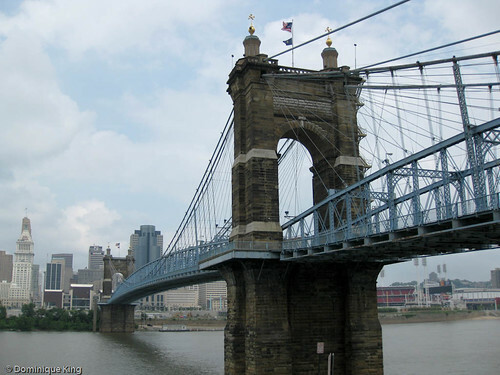 Surprising Cincinnati: Who Knew?-Check out this "top ten" list about some well-known and not-so-well-known features of Ohio's Queen City at the Baby Bloomr blog. This post included a couple of great shots of one of my favorite bridges, the John Roebling Bridge between Cincinnati and Covington, Kentucky, and mentioned some of my favorite Cincinnati stops like the Underground Railroad National Freedom Center and Skyline Chili! Melodies and Travel Memories-Amy shared this great list of Minnesota music at her A closer look at flyover land after I tagged her for this musical meme. That reminds me...it may be time to run another one of my Midwest Music Mix List posts!